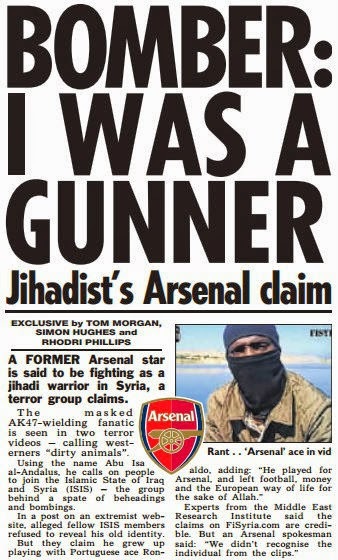 Arsenal has played down reports one of its former players is fighting as a jihadi warrior in Syria. A report in The Sun says a terror group claim a masked man seen in two terror videos "grew up playing with Portuguese ace Ronaldo" and "played for Arsenal, and left football, money and the European way of life for the sake of Allah." But the group has refused to reveal his old identity. The Sun report experts from the Middle East Research Institute said the claims on FiSyria.com are credible. But an Arsenal spokesman said: "We didn't recognise the individual from the clips."